Building 360 is a comprehensive guide for developing performance-based 360-assessments through web-based software. 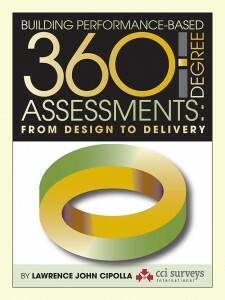 This break-through book was the first to focus on the specific “how to” tips and techniques for designing, developing, and delivering more effective 360-degree feedback assessment tools. It was designed for people who want to create their own 360-assessments and for those who want to revise and build more effective performance-related assessments. Building 360 has won 2 USA and 1 International book awards. Building 360 includes dozens of client-proven best practices and examples for getting your feedback assessment right the first time. A proven, structured, step-by-step format that guides you through the essential process for creating dynamic assessments for any target population. How to identify and assess the behaviors and practices that must be measured and optimized in an age of global competition. Building 360 will provide decision-makers, project leaders, and managers of developers with a structured guide for designing, developing, deploying, and delivering a relevant and effective 360-assessment process. Building 360 provides internal and external HR trainers and OD consultants with practical tools for how to build powerful performance-based assessments that work! Larry Cipolla founded his company in 1976 and is a recognized pioneer in performance-based 360-degree assessments—and one of the first companies to integrate feedback with training and development, action planning, and pre- and post-assessments to measure individual effectiveness over time. He has published more than 350 articles on leadership and managerial topics, developed more than 300 multi-rater assessments for clients around the world, and presented white papers at international HR and OD conferences such as, the American Management Association (AMA), International City Manager’s Association (ICMA), American Society for Training and Development (ATD), Society for Human Resource Management (SHRM), International Federation of Training and Development (IFTDO), and the National Association of Realtors (NAR-RMNI). He has also served as a Spencer Foundation Research Fellow at the University of Minnesota, an adjunct instructor at the University of Saint Thomas, and learning systems supervisor at the 3M Company.